General Description of IL-6 / Interferon beta-2. IL-6 is a potent lymphoid cell growth factor that stimulates the growth, survivability of certain B-cells, T-cells. It plays a critical role in B-cell differentiation to plasma cells, is a potent growth factor for plasmacytoma, myeloma. IL-6 is produced by a variety of cell types, including monocytes, fibroblasts, endothelial cells. Upon stimulation, macrophages, T, B, mast,, glial cells, eosinophils, keratinocytes, granulocytes also secrete IL-6. It is involved in host defense, acute phase reactions, immune responses,, hematopoiesis. Anti-IL6 antibody staining is expected to be primarily localized to the vesicles. 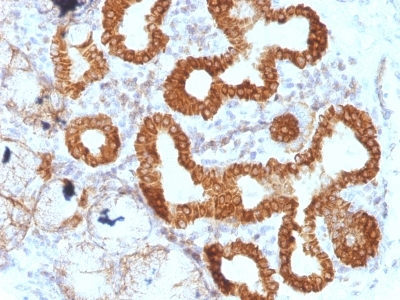 Variations in IL-6 / Interferon beta-2 antibody staining intensity in immunohistochemistry on tissue sections are present across different anatomical locations. Low, but measureable presence of IL-6 / Interferon beta-2 could be seen inlymphoid tissue in appendix. We were unable to detect IL-6 / Interferon beta-2 in other tissues. Disease states, inflammation, and other physiological changes can have a substantial impact on antibody staining patterns. These measurements were all taken in tissues deemed normal or from patients without known disease. enQuire Bio's IL-6 / Interferon beta-2 Anti-Human, Mouse Monoclonal is available for Research Use Only. This antibody is guaranteed to work for a period of two years when properly stored.